A long-awaited list of recommendations designed to tighten the procurement rules of Houston Community College was presented to trustees last week. The proposals range from requiring board members to disclose contributions from a vendor when that vendor is bidding on a job, to implementing ethics training for vendors. A final, written report is scheduled to be released Thursday at HCC’s monthly meeting. The recommendations, crafted by Arturo Michel and two other attorneys he brought on, come in the wake of last year’s guilty plea for bribery by Chris Oliver, who was an HCC trustee at the time. Oliver admitted to accepting a quarter of a million dollars in bribes with promises to steer contracts to select HCC vendors. For a detailed account of Oliver’s bribery scheme, click here. That vendors disclose any contributions to trustees and detail relationships between family members, consultants, and subcontractors to trustees. The blackout period — the time when a bid is first advertised through 30 days after a contract is signed by the Chancellor — would be extended to college employees. Forbidding vendors and subcontractors from employing relatives of trustees and employees. The list of recommendations is long, and although some trustees said there were good suggestions on the list, several trustees questioned some of the proposals made by the attorneys. Chancellor Cesar Maldonado did not respond to a request for comment. “The report and proposal will be presented on Thursday that will be reviewed and discussed by the trustees and administration,” an HCC spokeswoman told The Texas Monitor. “There are some changes they’re arguing for in procurement, but mostly those changes are intended to keep the trustees further away from the procurement process,” Hansen said. He said the attorneys’ investigation missed the mark in this regard: there was no probe into how vendors with the lowest bid are seldom presented by the administration to the board for approval. He recalled a recent proposal that was presented to the board that dealt with cleaning HCC parking lots. Hansen said the explanation given by the administration is that the higher priced bids are a better value. “Well how do we know that?,” Hansen asked. He also questioned other proposals, such as vendors taking an ethics class. Does he think that an ethics class will actually make a vendor intent on bribing a trustee or HCC employee less likely to do so? Trustee Robert Glaser, who chaired the audit committee last year said he was “underwhelmed,” by the report’s recommendations. “There were no fireworks in the report,” Glaser said, but he did note there were some proposals that were constructive. He also said he believes that, in order to investigate what went wrong during the Oliver/bribe-taking era, the board must hire their own attorney for an exhaustive probe — an attorney who does not report to the Chancellor. Glaser said he believes that this investigation is incomplete without a trustee-sponsored probe. “I hope that our board will step up once this report is complete and submitted — that we hire somebody who reports directly to us, who at the very least, reviews what these guys have done, but then comes back and looks at the situation, and advises us as to what they think should be done, what has happened and where we should go,” Glaser said. “They’re proposing that we add more rules, but see, we’ve got all the rules,” Wilson said. 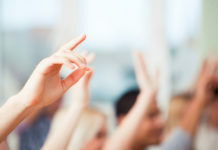 He noted that trustees already must disclose conflicts of interest publicly if they have a connection to a particular vendor. He also pointed to a blackout period already in place. Indeed, while one of the attorneys’ proposals extends the blackout period to all employees, it appears that rule may already be on the books. All three trustees interviewed by The Texas Monitor pointed to one proposal that they considered a non-starter: that any communications between board members and HCC employees must go through the HCC administration. It would also require employees to report any contact with a trustee. “I think it’s nonsense and I hope my fellow trustees won’t adopt it,” he said. Some trustees said that they often talk to HCC employees to get their take on any number of issues. Also, this proposal would limit the information that the trustees get about the college, they said. The only information about HCC would come to the trustees only though Chancellor Maldonado. Glaser said he believes that if this proposal is needed, then the college’s culture is indeed crippled. Wilson said he often talks to HCC employees to get their perspectives — and to hear about problems at the college that the employees are afraid to sound the alarm about. HCC Trustee Chair Carolyn Evans-Shabazz said Monday morning she is deciding if she will comment. If she does, we will update this report. If some of the proposals are controversial, so was the journey to getting the report finalized. Oliver’s guilty plea to bribery became public on July 7, 2017. The college’s investigation into the HCC procurement process began July 18, 2017, when Maldonado hired former Harris County Commissioner Gene Locke, with Andrews & Kurth, and former Assistant U.S. Attorney Vidal Martinez, with Martinez Partners, as special counsel to probe the college’s procurement process and other internal affairs. Less than three months after HCC brought them on, they were off the job. Locke claimed a conflict of interest when contacted at the time by The Texas Monitor. Martinez did not return a call seeking comment when he was called at the time. He was let go by the trustees, some citing the costs associated with Martinez. Their unfinished investigation cost taxpayers more than $207,000, invoices show. On Oct. 31, 2017, Maldonado turned to Michel, with Thompson & Horton, to complete the probe. In addition, Lawrence Finder, of Baker McKenzie, was brought on to work an Oliver- related case in connection with an HCC employee. In all, the Oliver investigation and Oliver-related inquiries cost the taxpayer $383,600. Editor’s note: A previous version of this story incorrectly stated that Lawrence Finder helped craft the Oliver/procurement report. The Texas Monitor regrets the error. That’s not intimidating at all! Corrupt to the hill, liars. Just like Shelia and the Mayor all in the same jar. I’ll give you something I will fill it with $$$. Turner has been scum for years, when he was councilman he got millions as an attorney. But Houston is stupid cause they want blue!!! Liberal!!!! Now you have the crime and all of a sudden you want to do something!!! To late, money has arrived in the pockets. Ask the real sheriffs if Harris county.!!! The is deep with Soros funding all this!!!! Dave Wilson is certainly afraid of transparency, isn’t he? Just exactly what is he trying to hide? Since the HCC system appears to be corrupt to the core, perhaps it should be disbanded with the campuses turned over to a more responsible system such as the Lone Star Community College system.